It isn’t often that you are offered a free basketball camp, let alone a basketball camp designed for kids with type 1 diabetes. That’s exactly what the Moses E. Cheeks foundation offers kids ranging in age from 5-18 years old. 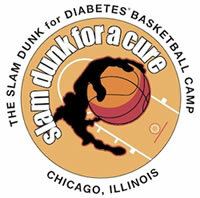 The camp is called Slam Dunk for Diabetes Basketball Camp, they are the only camp of its kind in the United States. The camp was the dream of Monica Joyce, Monica’s son had played basketball for over 10 years. She works in the medical field with people of all ages that have type 1 and type 2 diabetes. In 2003, Monica had read about a basketball camp for kids with diabetes, founded by former Portland Trail Blazers center, Chris Dudley. She thought how wonderful it would be to offer the same type of camp in the Chicago-land area. Her goal was to provide the opportunity for kids to learn to manage their diabetes, while having fun playing basketball, and incorporate teaching moments while they were playing ball. She had big dreams, because it takes a lot of time and effort to orchestrate a camp where all the kids would have diabetes. With the camp being offered free to all, it would take a lot of volunteers to pull this off. In order to make this dream a reality, there would have to be skilled medical personal, coaches that know diabetes, parents that are willing to help coordinate the camp in their town. You need sponsors to fund the venture, a venue big enough to house up to 150 kids, guest speakers that can relate to kids from 5 to 18 years old. Monica didn’t let any of these details get in her way! Now that Slam Dunk has been well established in Chicago, they are looking to branch out to other states. I was thrilled to hear that they were coming to Milwaukee. Chicago is approximately 90 miles from Milwaukee, to far for our families to drive back and forth. Enter Jodi Borck, who lives in Milwaukee. Jodi has a 14-year-old son with type 1 diabetes. I met Jodi on facebook over a year ago. She was instrumental in bringing Slam Dunk to us. She didn’t think that it would be this year, as she was hoping to bring the camp here in 2014, but when Novo Nordisk said they wanted to sponsor the event this year, well, how could anyone say NO? When the call went out to the staff at Children’s Hospital of WI, there were so many that volunteered, some had to be turned away! 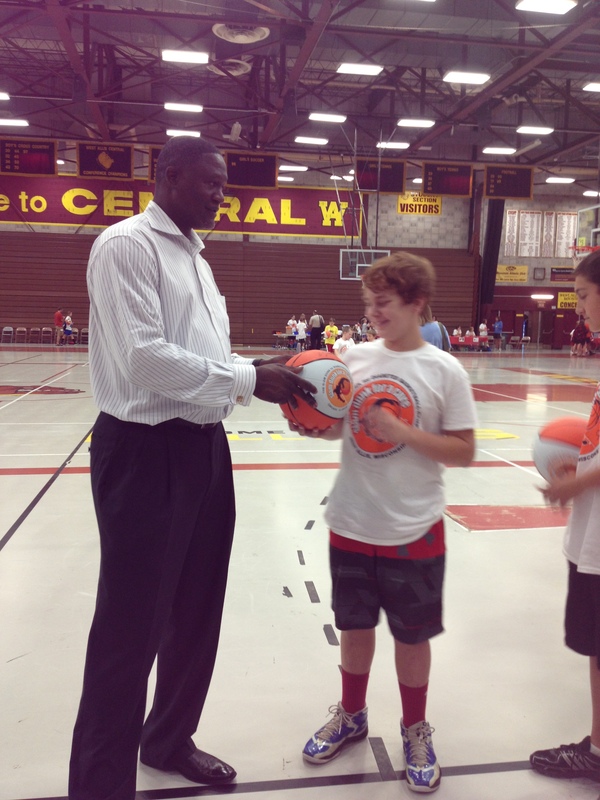 Jodi’s husband stepped in to help coach, along with Staff from Slam Dunk. Big thanks to Jodi and her family for helping bring Slam Dunk to us. What a surprise to learn that the guest of honor was no other than Dominique Wilkins, aka “The Human Highlight Film.” When my 16-year-old, non-d son Tony found out that Joey got to meet, have his picture taken with, and receive an autograph on his basketball with Mr. Human Highlight Film himself, oh was he upset. It was an honor for Mr. Wilkins to travel all the way to WI just to meet and talk to our kids about his struggles, and triumphs with type 2 diabetes. 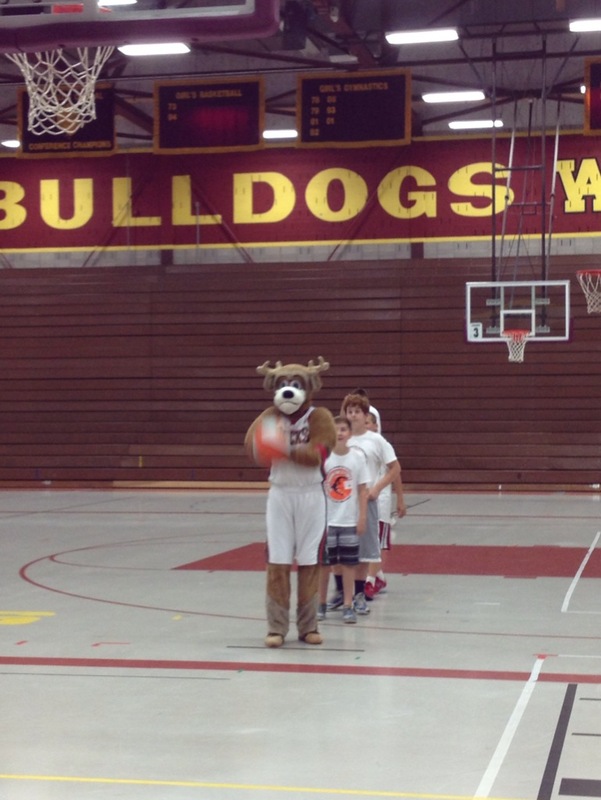 On the last day of camp, the kids had yet another fun surprise, this time it was from the Milwaukee Bucks Mascot, Bango. He played games with the kids, gave them each a Bucks headband and took pictures with the kids. The morning starts at the check-in table where the kids each received a really nice sports bag with a basketball and t-shirt which they would use for the camp, their folder which had their registration, medical & contact information forms, and the name of their particular group, by age. Then over to their assigned medical person for their first blood sugar measurement. Then off to the basketball court. The kids had a blast learning skills, playing games like 21 and sharks and minnows. This may have been the first time a camper has ever dribbled a basketball! It was gratifying to watch the kids of all ages helping and encouraging their peers or younger players. Joey got a kick out of a young 5 yr old boy, they were playing a game of sharks and minnows, Joey was behind the little boy, as he was dribbling away, he said to Joey, “are you a shark?” Joey replied, “no,” and the 5 yr old looked him in the eye and said, “why can’t I trust you?” Joey laughed, and that was the first story he told me when we got in the car. A lasting friendship was developed! Like the American Diabetes Associations Diabetes Camp, this was more than playing basketball for a lot of these kids, and their parents. There is something to be said about being with a group of kids that have the same disease in common. There can be feelings of isolation at times with type 1 diabetes, so to see all these kids together, in one place, playing basketball, talking, laughing, checking their blood sugar with no embarrassment, it’s very heartwarming. I overheard Joey explaining his Omnipod pump to one of the boys who was on the fence about which insulin pump he was going to choose. They all have that one common denominator, diabetes, it really means a lot to them to be together. 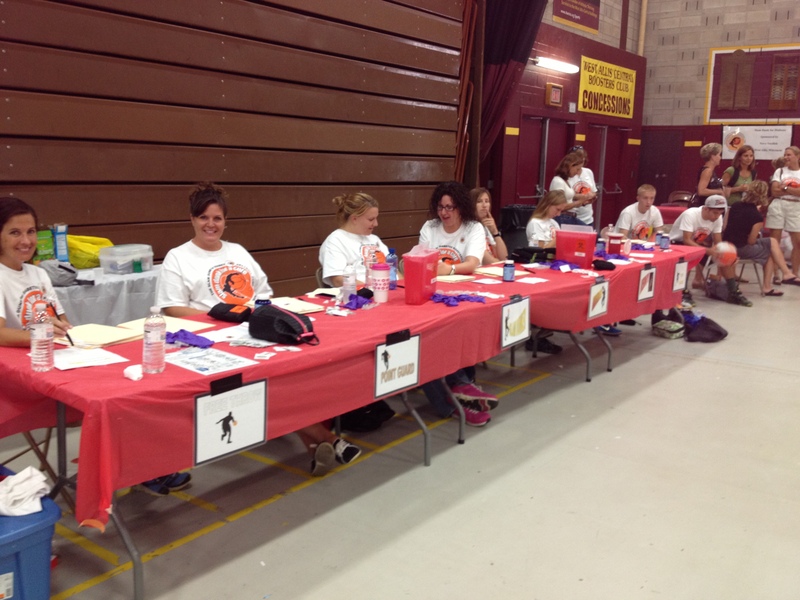 This camp gave parents the opportunity to talk to each other about type 1. It’s always a blessing to meet other parents of kids with diabetes. We also have feelings of isolation, most often we are the only parents in our circle of friends with kids with type 1. It’s wonderful to meet parents that go through the same things that we do. I could finally put faces to the posts of some of the moms in our facebook support group! We face a lot of the same challenges and it’s nice to share them with people who understand! Many of us are chatting on facebook at 2:00 am when we get up to check blood sugars, now we’ve actually met in person. 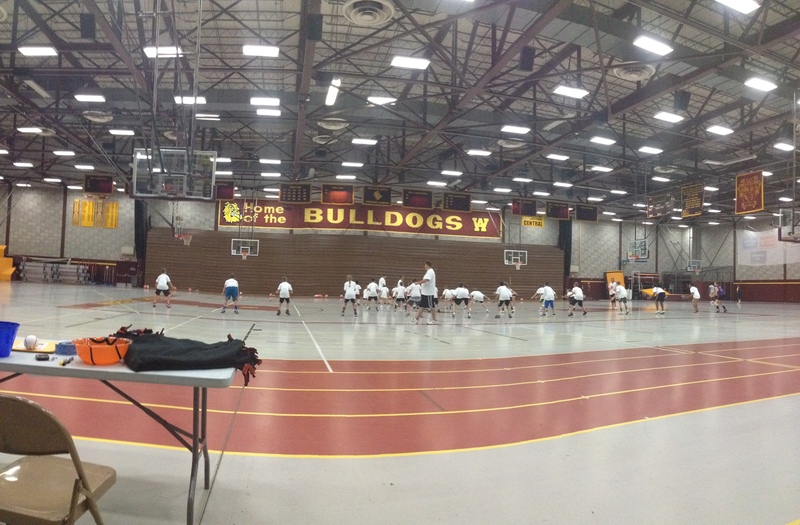 As a parent, I can’t say enough to Monica Joyce for following her dreams, and making this basketball camp a reality. Imagine her surprise when she found out that one of her patients that she told her dream to, Mrs. Joan Judelson, was the wife of Robert, who is a member of the Board of Directors of the Chicago Bulls. He loved the idea, and Monica’s dream was becoming a reality. The very first camp session was held in August , 2004, in Chicago. What a blessing!